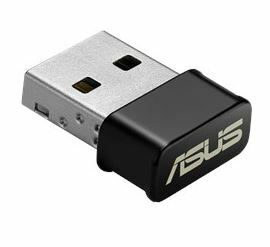 Asus USB-AC53 nano AC1200 dual-band wireless adapter is world’s smallest dual-band 802.11ac MU-MIMO enabled USB wireless adapter. This will enable super-fast Wi-Fi in a nano-sized package that’s small enough to leave plugged in! Super-fast Wi-Fi ever becomes more accessible via USB, going up to 867Mbps on the clear 5GHz band. Using 802.11ac wireless, faster connectivity and enjoyment come to all your devices. The dual-band operation suits mainstream and power users. The 2.4 GHz band is perfect for web browsing, email, and social networking, while the 5 GHz frequency enables smooth 4K streaming and online gaming for blazingly fast and lag-free home entertainment. This USB-AC53 Nano wireless adapter is specially-designed to be compact and durable to safely and securely stay plugged into a notebook PC even inside a slim carrying case. Its MU-MIMO technology boosts connection speed when multiple compatible clients are online. If you are interested, check more about this USB nano wireless adapter here . I bought 3 of these for various devices in my home, and they work well for the most part. I have an AC router in my home and these connect to it very nicely. I consistently get data rates of 525 - 650 Mbps, with an occasional burst to 866 Mbps. File transfer rates are excellent, and streaming video from outside (Netflix) starts in HD mode right out of the gate (it used to start in a low-def mode, then over the course of 5-10 mins it would buffer enough to convert to HD). I'm only giving 3 stars because I am finding the USB connection to my computers to be unstable. I have tried both direct connection them to USB 3.0 ports and by using the cradle & cable, but in both cases I find I get random USB disconnect events. I do have the most recent drivers (as of late November 2014). Occasionally, i need to reboot any computer in question to get it to recognize the adapter again. I don't seem to have this issue with any other USB 3.0 devices on any of my computers, so I'm guessing there's a flaw in the device driver for this adapter. I am hoping another driver update fixes this problem because these are otherwise fantastic AC adapters. Easiest installation of a piece of hardware in a long, long time. Downloaded the drivers, installed the card, ran the install software, no reboots, card came up and connected. Windows 7, i7-2600k. Was using an Ubiquity AirWire previously, a stupendous product in its own right. This ASUS device connects to my Ubiquity Unifi AC Lite located downstairs (just a floor and a few feet of air between the two devices) at 866mbps. My network transfer speeds went from 10-11MB/s to 25-30MB/s+ With the AirWIre, when transferring files over the network, browsing the network in Windows Explorer was essentially useless. Now the entire network flies, and I don't mean kinda. This card, combined with a Unifi AC Lite, is the best money spent on computer parts in years, hands down. Works great, my desktop is about 40ft away and blocked partially by an interior wall, with my Windows 10 PC. After I installed it Windows recognized and installed the correct drivers for both the Wi-Fi and Bluetooth. Have had zero issues or problems. I bought this card 2 years ago, and it just stopped working last week. A few months ago, it started acting up. The internet connection was really slow. In the last few weeks, it started dropping connections, then it finally stopped connection to networks altogether. The PCE-N15 worked fine before it died. The speeds were good enough, but sometimes it would randomly be slow. I know it was the card because other devices connected on my network weren't lagging. I would say that consistency would be the main problem. For the most part, I never had a lot of problems loading videos; for example netflix, cbs.com, and hulu loaded their content in a fast enough time. The only problem would be with loading youtube videos since they would constantly buffer. As for downloading, I usually didn't have a problem. Games from Amazon or steam downloaded fast enough. Downloading a windows update could have been faster. For the included software, it wasn't very useful. I uninstalled the Asus utility and drivers after the first two months. It caused problems with my connection. I eventually just downloaded the Realtek drivers, as someone said in one of the amazon reviews, and it worked fine afterwards. Overall, I would say that it was okay. I didn't pay that much for it, so the performance for the price made up for the problems. About the best you can get but what do you expect from ASUS? THE BEST! Was easy to install and my signal downstairs is amazing now! Return to top of "Asus USB-AC53 Nano AC1200 Dual-band Wireless Adapter"! !